The TS-600 went on sale in or about August 1957 as the first transistor radio built by Nippon Victor, (NVC - later to become JVC). While this domestic Japanese model is essentially the elder sibling of the RCA Victor P-331 marketed in Canada, it is easily distinguished by its black cabinet colour and vermilion tuning dial knob. The entire front panel is reverse-painted in tan, gold and black with a pearl-like finish that escapes words and my limited attempts to capture it with the camera. 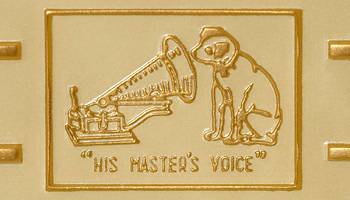 Nipper sits faithfully in the lower left corner, complete with the famed "HIS MASTER'S VOICE" lettering below. One nifty piece of design flash easily escapes the eyes. Look to the right above the tuning dial knob and you'll notice what appears to be a small window with the number "6" showing through from behind. The volume switch is right behind there, so the first impression is that it might be a volume level indicator. But it's not. There's no window. Then the eye recognizes the shape and locks on the three legs hanging down. Of course, it's a 6-transistor logo done in reverse paint. There's no doubt that the Victor TS-600 is one of the rarest and finest of the early Japanese transistor radio models. The radio you see here is one of just a few samples I have come across to date. Note that I have also seen three variants of this radio under the original TS-600 model number. One differs from the sample on this page only in that it does not have the raised VICTOR lettering along the bottom of the cabinet face. That's the radio that graced this page for the past few years in a guest appearance. The second variant is in the same black, tan and vermilion colour scheme, but the reverse-painted face panel has the company's initials (NVC) in stylized lettering in place of Nipper. 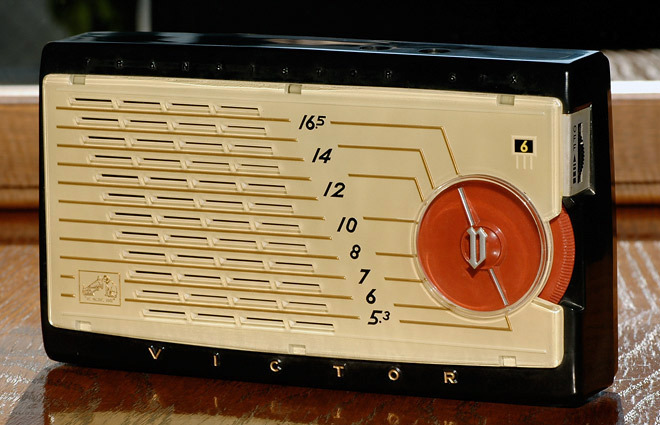 And the third  the "RCA International" Victor TS-600  is in the blue colour of the RCA Victor P-331, but uses a completely different design for the face panel.